As I have already alluded to, there is this terrible in-between time for all pregnancies when regular clothing becomes too small, and maternity clothing is still fits too much like a tent. This mis-fit period is shorter for M.O.M.’s thank goodness, but it also hits sooner for them, before most people know you are expecting, which presents it’s own challenge: What on earth do I wear? My jeans were already getting noticeably snugger before I was 5 weeks along! By the time I was 7 weeks jeans were out of the question and I was in elastic waistbands only. I literally wore through the seat of the 2 pairs of ‘normal’ pants that I could still fit into. I didn’t feel confident going to buy lots of maternity clothes yet because, well, nobody really knew I was pregnant, and most maternity clothes are pretty obvious, or at least have a big stretchy waistband that is a dead giveaway. I did go shopping and found a few nifty new pairs of ‘regular’ pants with elastic waistlines that got me through, and actually they worked well for postpartum as well. Dresses would be a good option, except I didn’t have many. My favorite maternity clothing item was a pair of bib overalls. Buy large – you’ll need the room! They were the only item that actually covered my girth and stayed up in my final week! Another great item that I wish I would have discovered sooner was belly bands. They are simply stretchy rings of fabric that go around your midsection. So as your cute ‘lil baby bump (or for us M.O.M.s perhaps ‘voluptuous belly bulge’ is more appropriate) starts to pop out under your regular shirt, you’re not baring your skin. The belly band shows beneath your shirt, which I think is so cute, and it saves you from having to buy a bunch of in-between-size maternity shirts…and save up for the tent-size ones you’ll need later on. I recommend getting several belly bands that coordinate with your current (non-maternity) wardrobe because not only are they good during mid-pregnancy, but they are also EXCELLENT for nursing moms, because they allow you to nurse in public without baring your belly or buying expensive nursing shirts or futzing with a nursing cover or blanket. I used them under my clothing everyday after the babies arrived so I could nurse easily when needed. Also, be sure to buy the extra tall or wide belly bands, because some are rather ‘skimpy’ in that the fabric is only about 8” wide, and let’s face it twin mamas, 8 inches isn’t going to cover your ‘buns in the oven’ very far into this pregnancy! I hear ya! I couldn't keep my pregnancy a secret longer than about 5 weeks because I started showing instantly. 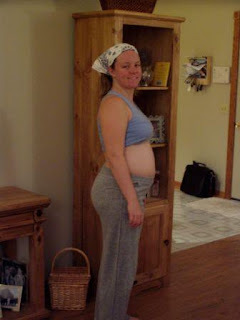 By the time I was 12 weeks, I was as big as my also pregnant friend who was about 20 weeks with a singleton. Oh the joy of twin pregnancies! :) I didn't realize that both your sets of twins are identical. What are the chances? That's awesome!! Thanks for visiting my blog! I know the 2 sets of identicals was a crazy realization! I thought it should be 1 in a million, but actually it is only about 1 in 70,000. So, yes, STILL better than winning the lottery!